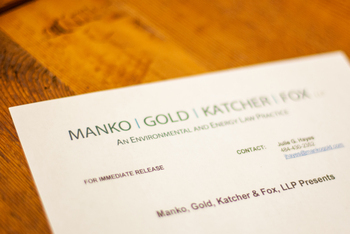 Philadelphia, PA (December 17, 2007) – Manko, Gold, Katcher & Fox, LLP (MGKF), an environmental, energy and land use law firm, is pleased to announce that five of the firm's attorneys have been named Rising Stars for 2007 in the area of Environmental Law by the Pennsylvania Super Lawyers publication. The five are: Nicole Moshang, Brenda Hustis Gotanda, Carol McCabe, Michael Gross, and Todd Kantorczyk in the area of Environmental Law. Rising Stars listings were published in the December 2007 issue of Philadelphia Magazine and the Pennsylvania Super Lawyers 2007 magazine.